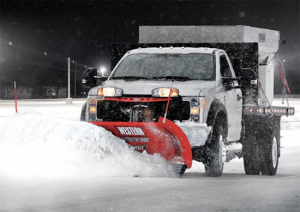 Western Products, manufacturer of Western snow removal and ice control equipment, released the Pro Plus HD straight blade plow. Compatible with up to Class 6 trucks and measuring 34 inches tall and 10 feet wide, the plow is designed for the challenges of heavy contractor jobs and municipal applications, said Western. The 11-gauge powder-coated steel blade is reinforced with eight vertical ribs and includes larger hydraulic rams, pins, gussets and hardware, plus a T-frame design with a massive center pin. Users can customize the plow with accessories, including half-inch, abrasion-resistant carbide cutting edges; blade angle stops; snow deflectors; shoe kits and more. 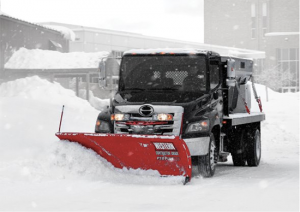 Western plows also offer the Fleet Flex electrical system, the UltraMount 2 snowplow mounting system and the Security Guard anti-theft system, among other features. The company also announced design changes to their flagship Wide-Out adjustable wing plow and unveiled the new Wide-Out XL plow. The updated Wide-Out plow includes flared wings and is now 2 inches taller at 31 inches. This size update allows for snow operators to be more efficient on their jobs, carrying more snow with each pass, according to the company. The new, larger version of the plow, the Wide-Out XL, extends from 8 feet, 6 inches to 11 feet in straight blade mode and fits up to Class 6 trucks. Wide-Out plows include hydraulic adjustable wing technology, allowing the operator to change the wing position from straight blade to windrow to scoop from the driver’s seat. The new plows are reinforced by vertical ribs (six on the original and eight on the XL) and a heavy-duty quadrant. The wings slide laterally across a new, structurally reinforced slide box to prevent bending, and a dual power bar provides torsional strength and rigidity across the entire back of the plow blade to eliminate blade twisting, said Western. More information regarding the launch and availability of the Western Pro Plus HD straight blade snowplow will be available later this year. The Wide-Out and Wide-Out XL adjustable wing plows will be available on Western’s website in May 2018.